Friday, Feb 15, 2019, 3 – 4:30 p.m.
With the growth and mobility of human populations worldwide, mental health practitioners increasingly serve clients from diverse cultural, geographic, religious, ethnic, and language backgrounds. Given this diversity, it is not possible for mental health practitioners to provide maximally effective services to their clients without understanding of their culture and emic perspectives on mental health and healing. However, thus far little research has been done on traditional healing practices among Punjabi Sikhs in Canada. 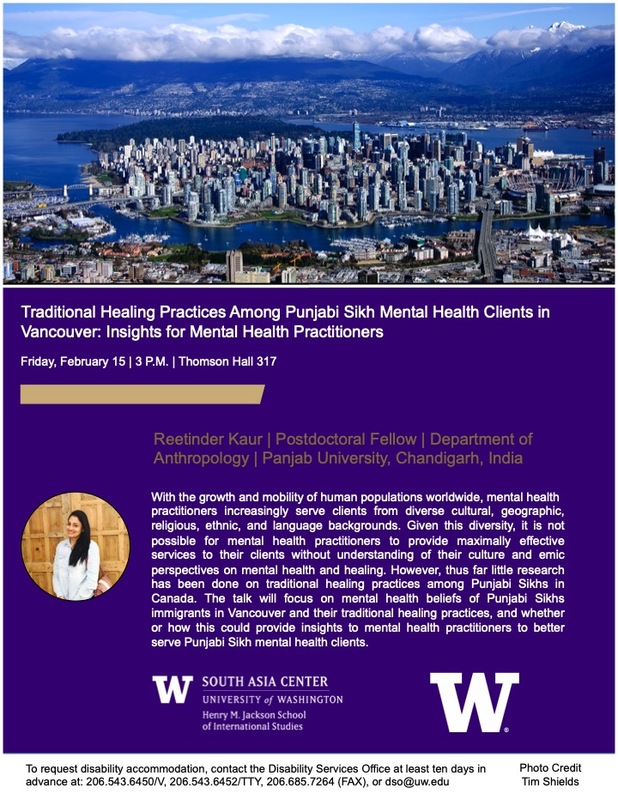 The talk will focus on mental health beliefs of Punjabi Sikhs immigrants in Vancouver and their traditional healing practices, and whether or how this could provide insights to mental health practitioners to better serve Punjabi Sikh mental health clients. Reetinder Kaur is a post doctoral fellow in the Department of Anthropology at Panjab University, Chandigarh.